A friend laughed a little. I was a little skeptical. “Greenwich Village” sounded like a bit of an overstatement. And it surely was. Although it pointed to a unique charm and style that many have become hooked on. We waited in immaculately ordered lines at Shibuya Station on the Inokashira platform. Shimo-kitazawa was the next stop on the express – only three minutes away. It was a Friday night and the platform was crowded with the usual pensive faces of Tokyo commuters. But there were more 20 somethings than usual and the odd person clambered awkwardly onto the train with an instrument and found a place to squeeze into. Some of the best times start as unplanned and turn into something special. Shimo-kitazawa is something similar. Once a farming area that grew steadily soon after the great Kanto earthquake in 1921, Shimo-kitazawa blossomed as a counter-cultural hub during the 70’s. The musically inclined and comedic youth began migrating from the popular stomping grounds of Shinjuku to colonise the establishments of “Shimo”. It wasn’t long before it began to hum with distinct melodies and comic voices providing a fertile scene for new talent. Some went on to become quite famous and the reputation of the area grew as did the number of live houses, bars and restaurants, and a whole array of other stores. But none of it was planned. In fact, it is due to the poor planning that the streets are too narrow for any significant traffic and the buildings have remained low-rise, giving the area it’s unique feel. We arrived and made our way out the South exit and took a right down the street. I couldn’t help but feel a carnival type atmosphere with coloured lights and sounds of video game chiptunes emanating from gaming centres, which contrasted against groups of fashion conscious shoppers carrying clothing bags and bar hoppers smiling broadly making the most of the start of their weekend. Our first stop was Mother. It felt as if we were entering into a Daliesque-slash-child’s fantasy book barscape of intricately decorated stone. Nobu, the manager, said the bar was established 46 years ago and it’s current incarnation is 26 years old. He is a true local and regularly DJ’s at events around the area. He passed us a menu with an impressive range of boutique beers and cocktails and we decided on a couple of delicious coconut mojitos. We finished up and made our way across the road and took an elevator to the 3rd floor to the Shooting Bar. For 2,500 yen we were served a drink each and then shown the ropes of how to shoot a couple of BB hand guns and sniper rifles on the range. Having a drink while testing our shooting skills against one other was a lot of fun. After a drink, we headed across to the other side of Shimo. Fresh tunes floated out of bars as new arrivals came in or others stumbled out and an atmosphere of cool could be felt as we wandered between drinks. The maze like alleys were filled with a predominantly young crowd browsing through the multitudes of clothing stores, many of them second hand, procuring a range of fashionable items at a deal. 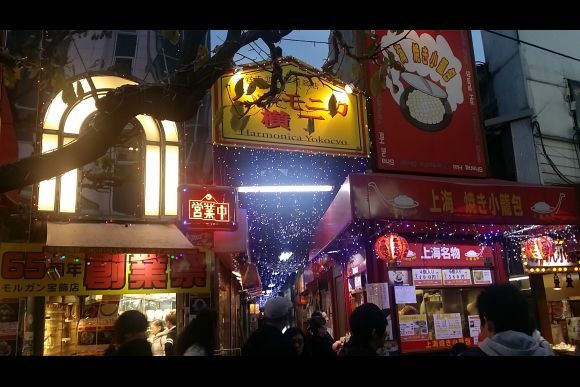 Speciality stores and boutique outlets were dotted around the Shimo nooks and crannies waiting to be discovered. Neon flamingos could be found on the North Side, and street art of edo period geishas and samurais, to more modern depictions of a cartoon like baker at work and abstract renderings of flowers coloured the garage security doors of a few shop fronts. The panoply of trendy bars was bolstered by small cafes and restaurants serving a large variety of cuisines among other laid back hang-out spots catering for all budgets: shisha bars, pool halls, and about eight speciality movie theatres such as Tollywood featuring a variety of independent films comprising of shorts, anime, and art-house. We decided to pop into Shisha Two. Tomo, the owner, said they opened Shisha One 13 years ago and Shisha Two 8 years ago. A very chilled out vibe hung below the smoke filled room with people lounging on old couches and tapping away on computers or chatting to friends. We ordered a 500 yen drink each and a blueberry shisha from the menu of flavours, 1000 for the medium size but more than enough to be shared between two people. Only about 50 meters away through a snug alley and a couple of bars from one of the two massive Shimokitazawa signs, was Little Soul Cafe on the second floor. Hundreds of records lined the shelves behind the bar. After listening to some records and having a drink, we decided it was time to call it night. Shimo will soon have a significant face lift and locals are wary of the change. Town planning for the area has designated a new highway to be built directly through it. The save Shimokitazawa movement has had many people flock to the cause, but their efforts seem futile. The redevelopment is sure to go ahead and Shimo-kitazawa station is currently being redeveloped. Many businesses in the area are privately owned boutique establishments and this is what largely comprises the charm of the area. The new plans appear as if the mix of shops and style of the area will be changed into the more usual commercial type shopping and dining area seen in other parts of Tokyo. All of this change could be good of course. But there is no doubt the current unique style endemic to Shimo-kitazawa will evolve into something else. The result has yet to be seen. As we made our way back to the station we came across Okun, the owner of Ghetto Bar. He was riding his skateboard, as he said he often does, running into the usual suspects that frequent his bar and encouraging strangers to drop by. “Come to my bar! I’ll show you the way,” he yelled as he zoomed past. He saw he got our attention and stopped. “Come on come on,” he said in English that he apparently learnt in Canada. We looked at each other and smiled conveying the thought of why not? silently and followed in Okun’s tracks to his bar only a short distance away. Despite our reservations we felt strangely obliged, and besides, it was a Friday night. The customers were made up of a highly eclectic crew, all friendly and swaying to the mellow tunes, and told us all kinds of anecdotes to help wash the shot down. We settled in for a couple more drinks. Good times were had by all and in the wee hours of the night as late night straglers came and went and we met a whole new set of friends that have welcomed us with open arms ever since. It’s true indeed the unplanned can turn out better than the meticulously planned. There is no better example of that than Shimo-kitazawa.